I somehow could only upload one picture and I upload the outside system. 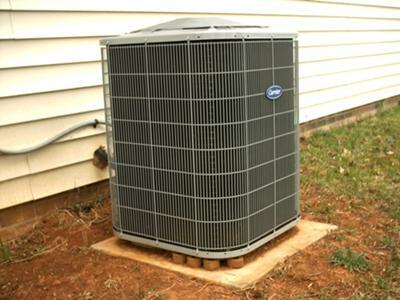 I had my old carrier central air conditioner replaced with new carrier central ac units. The problem with my old carrier ac was it keeps freezing for no reason. It’s heat pump. Carrier Ac didn’t give me much problem. My old Carrier was like 11 or 13 years. I’m not really sure. I got quoted from 5 differences contractor and it ranges from 6 to 7 thousand dollar. I’m an extremely lucking person. The hvac guys, who replaced my central air conditioner was from a friend of friend. No, it was not easier job. I watch them work for few times and it took them two day to finish it. My new heat pump had been running fine. 900 dollar to replace central air conditioner units will put any contractor out of business, but I need help and they help! I was financially in bad shape. I had recommended to them to relative and friend. Comments for Hvac guys replace my air conditioner for 900 dollar! Lady... Trust me when I tell you, I can tell this unit was installed for 900$. The unit is sitting on a decrotive brick. I'm pretty sure permits were not pulled on this job. Looking at the picture; this is a larger cabinet unit 3.5 - 5ton. As a Factory Authorized Carrier Rep. I can tell you the cost of this unit far exceeds 900$. This unit was obviously second hand or stolen. Its ashame cheap customers like yourself never want to pay a decent wage to have a factory trained technician, like myself, properly install their units. There is a reason why these units cost thousands of dollars. If you got that unit installed for $900 then they stole it from their work. The $900 went in their pockets and their company is fixing to catch them and probably come see you soon. Hey Grey, you got a sweet deal. I don't know who these guy's were, but that is a steel. I need a new unit, and quote is over 5000..Help! Send me these guy's..Magdalena Limon 817/858/0476...Seriously! I think 900 dollars is typo. Probably 9000 dollars. I was wondering how contractor stay in business for 900 dollars. ??? Did this unit fall off a truck? I am Sorry the picture doesn't match the story. If they found a R22 unit for this price they gave it to you. Labor alone would have been close to $1000.00 for the time they spent. Granted I would have been done faster but maybe they had some issues to deal with. Any way I am glad to see guys help people out even if they don't make a dime. As a HVAC professional with twenty years in the business and having my own company. You can not survive the economic crisis by giving work away to the point you can no longer pay your liability insurance,Truck costs,phone,office expenses,tool expenses,gas,training,health insurance,pension benefits,advertising and shop rent. I would love to do the work for free but then I would have nothing and no longer would I be able to perform the work for my customers. 900 for what ac parts? Does the contractor replaced evaporator and the condenser for 900 dollar or just the condenser units?